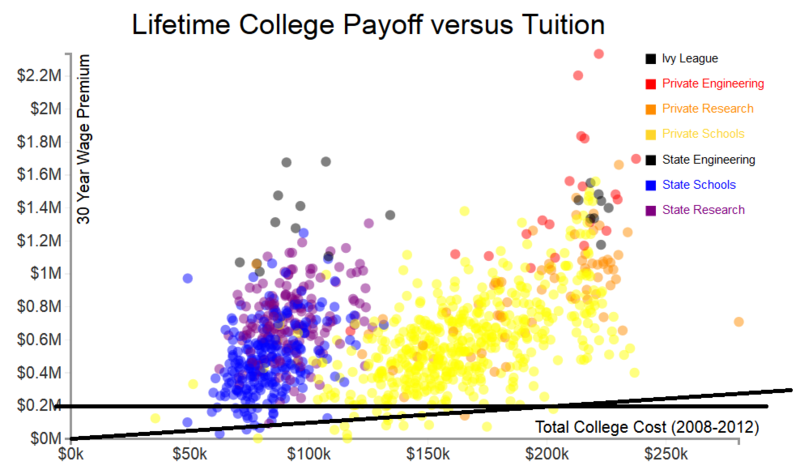 Using data provided by Payscale.com, the following chart defines how much better off the average student is in 30 years financially by getting a degree. As you can see, the most lucrative schools based on wage premiums are private engineering schools. The next few dots you see are state engineering, private research, and ivy league degrees. The dots below the ascending black line indicate schools whose tuition cost more than the wage premiums would gain the student in 30 years. Those dots represent folks that would have probably been better off financially by not going to school. The point I’m trying to make is that if you are planning on going to college, the best bet for you (if you are willing and or capable) is to enter engineering. For most folks, in 30 years, college will have paid for their tuition many times over so generally speaking the answer to the post is yes.